The Shoton Festival, literally known as “Yoghurt Festival” has started to celebrate in Drepung monastery of Tibet since from 1830s to mark the end of monks’ summer retreat, where the Ache Lhamo troupes were invited to perform at the monastic courtyard. As they performed, the monastery used to serve yoghurt to monks and devotees. 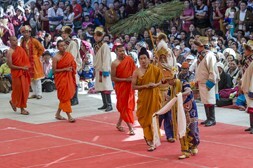 The festival later widely flourished through out Tibet and particularly during the reign of Gaden Phodrang Government. 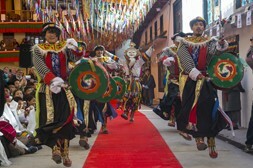 And this event is still popularly celebrated in and outside of Tibet to showcase its unique tradition. 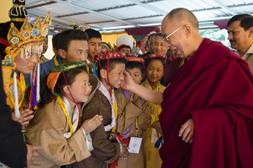 Since the Exile Tibetan Community settled in India, Tibetans have tried to preserve this unique yet authentic tradition on the advice of His Holiness the 14th Dalai Lama, by organizing its First Grand Shoton Festival in 1993 with participation of 4 troupes, which now reaches its’ 20th anniversary this year. 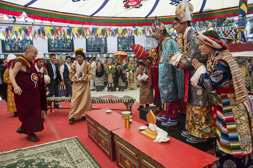 This year, the 20th Grand Shoton Opera Festival was organized at Dharamsala and it was began with the presence of His Holiness the 14th Dalai Lama as chief guest at the opening ceremony with other important dignitaries and audiences to witness the short synopsis of some opera stories showcased by few troupes. 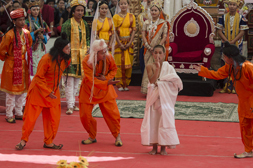 The 20th Grand Shoton Opera Festival happened from 27th March to 5th April 2015 for ten days at the ground of Tibetan Institute of Performing Arts, Dharamsala to celebrate the tradition of Ache Lhamo. A ritual dance called ” Ngonpai Don” was performed by the members of artistes from remote Solo Khumbu (Nepal) as an opening act to purify and bless the stage and then each of the troupes performed the customary extract from their operatic repertoire. Around 5000 people with different nationalities eagerly turned up for this opening ceremony to observe the unique cultural performances. A special audience with His Holiness the Dalai Lama was granted for the festival participants during lunch break, which was followed by a short meeting with heads of all the opera troupes and instructors. Twelve different troupes arrived at this year’s festival and performed different opera performances-The Tibetan Homes Foundation from Uttarkhand performed Khen Lob Choesum; the Kalimpong Tibetan Opera Association performed Sukyi Nyima; Doeguling Opera Association, Mundgod performed Nangsa Woebum; Phuntsokling Tibetan Opera Assicaion, Odisha performed Khewu Pema Woebar; Norgyaling Cholsum Opera Association, Poanta performed Drowa Sangmo; Tibetan Opera Performing Arts, Bylakuppe, performed Jowo Jhe Palden Atisha; Phendeling Opera Association, Chattisgarh, performed Gyalpo Jikten; Nepal Tibetan Lhamo Association, Kathmandu, performed Chaksam-Life of Yogi Thang Thong Gyalpo; Shar Khum Gyache Lhamo Tsokpa, Nepal, performed ritual dance “Ngonpai Don”; Tibetan Children’s Village School Chuantra, Himachal Pradeshi , performed Milarepa and TIPA on the last day performed Toenpai Zenam. All these playful Story telling performances are full of moral and virtues that can be easily understood and enjoyed by common people with limited knowledge. Over 420 participants including opera artistes took part in this year’s opera performances. The 20th Shoton Opera Festival saw three new troupes making their debut opera performances. These are Dhondenling Opera Association, Tibetan Children’s Village School Chuantra and Sharkhum Gyache Lhamo Tsokpa (Nepal). The Festival successfully concluded with a word of thanks from Mr. Pema Choejor, Minister of Culture and Religion and Mr. Lobsang Samten, Artistic Director of TIPA extending towards each and every organization including the sponsors and participating troupes for their tremendous contributions. 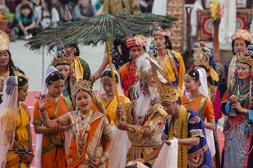 The Dalai Lama trust funded this program to supplement the travel allowances and lodging fees for the performing troupes-each of which consists more than 30 people. 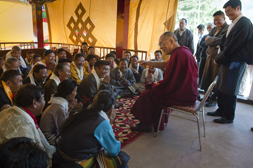 Organizing this artistic yet unique tradition of celebrating Ache Lhamo is also very important initiative to preserve Tibetan cultural heritage and its identity in exile, which His Holiness the Dalai Lama always consider one of the core responsibilities of all the Tibetans living in India as well as around the world. So we were pleased to make some contributions towards this program of celebration, preservation and continuation of rich traditions of Tibet.